THE ANAHEIM DUCKS were ice-cold in Saturday’s 3-0 loss to the Buffalo Sabres. The temperature in Buffalo on Saturday night was near-freezing, which about describes the offense of the Anaheim Ducks. They dropped their third straight game, falling 3-0 to the Sabres despite getting 40 shots on goal. Linus Ullmark was perfect in the net with 36 saves. John Gibson made 30 saves for the Ducks. The loss put the Ducks’ record at 19-14-5, good for 43 points and a tie for third place in the hectic NHL Pacific Division race with the Las Vegas Golden Knights. Saturday’s setback capped an eastern road trip with began with two wins. 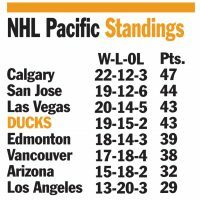 Going into their recent skid, the Ducks were 9-0-1 over a 10-game stretch. Anaheim will next be back in action on Thursday in San Jose against the Sharks (19-12-6), second in the division. ALSO: The Los Angeles Kings defeated the San Jose Sharks 3-2 in overtime, and will go for a three-game-winning streak Sunday night in Las Vegas.